Barton's Legacy-1924 bay. 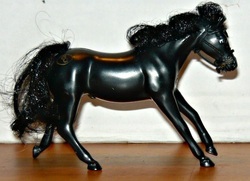 Sired by Sir Barton-r, out of Herd Girl-r.
OF Breyer, Classic, Black Beauty #3345 King of the Wind set. White Legacy-1940 gray (black base). Sired by Barton's Legacy, out of Kong (r) (GB). OF Flocky horse, very old. Black Legacy-1941 black. Sired by Barton's Legacy, out of Lady In Black (r). OF Grand Champion, Mini, Black Jack. Black Prison-1953 black. Sired by Black Legacy, out of Prison Pet. 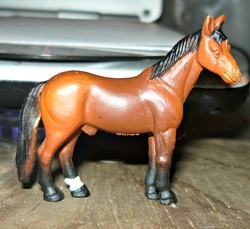 OF Breyer, Trad, Secretariat #700496 Irish Warrior. Corporal Punishment-1963 buckskin. Sired by First Corsair, out of Prison Pet. Sire is owned by Celtic Song Stables. Haarm None (GB)-1972 dark bay. Sired by Le Haar (r), out of Alecto (r). He was bred in Great Britian and stood stud there before being imported to the USA. Rhythm of the Sea-1974 bay. Sired by Sea Swap, out of Rhythm Dancer. Bred by WMHS. Majesty D Silver-1978 bay. Sired by His Majesty (r), out of Mamas Silver (r). Michigan Wind-1979 black sabino (possibly Dominant White). Sired by Cimmerian Wind, out of Michigan Snow. Bred by WMHS. Dam shares the same sire as White Beauty, Ky Colonel (r) who is the founder of that DW line. 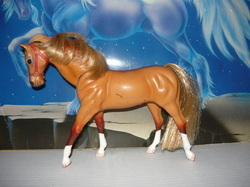 Living Legacy-1984 chestnut. Sired by Secretariat (r), out of Worthy Of Note (r). OF Breyer, Smarty Jones,#1345 Secretariat. Pic Credit at Crissi Goreham. 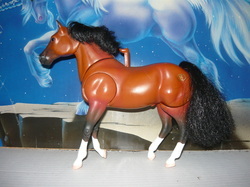 Gage Tester-1984 bay frame overo and sabino. Sired by Blue Gazi (r), out of Bevs Girl (r). Full brother to Blue Eyed Streaker (r). 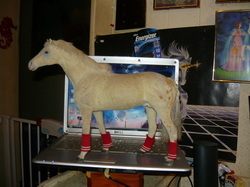 Very old OF Flocky horse. 1990-Cheer, gray (bay base) frame overo filly (x Lady In Waiting) o/b Dancing Horseshoes Ranch. Sunwell-1987 black. Sired by Halo (r), out of Wishing Well (r). A full brother to Sunday Silence (r). In the process of being painted by me. CM Pebbles Warmblood stallion. 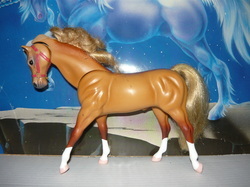 Merlin's Folly-1988 buckskin. Sired by Corporal Punishment, out of Nimue. 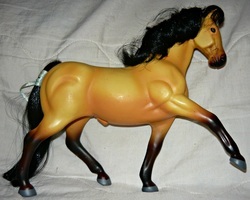 OF Breyer, Mini Whinny, Loping Stock Stallion #100172 Saddle Club 3 piece set. National Treasure-1992 buckskin. Sired by Milkie's Desire (r), out of Lady Alexis (r). 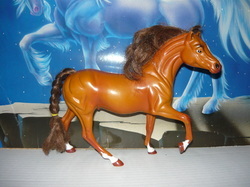 OF Breyer, Gem Twist #701196 First Competitor. Touch O Snow-1994 bay rabicano and sabino. Sired by Gage Tester, out of Snowtail. Blood Omen-1995 chestnut. Sired by Big Johnson, and out of Devious Queen. Bred with the help of Celtic Song Stables. 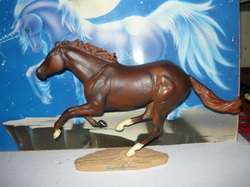 Gold Striker-1995 chestnut. 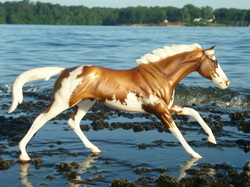 Sired by Strike The Gold-r, out of Tarnished Gold-r.
OF Grand Champion, Missouri Foxtrotter stallion, Dancer. My Majestic Relic-1995 bay. Sired by Forgotten Relic, out of My Sweet Queen. Bred by Shadow Wolf Stables. 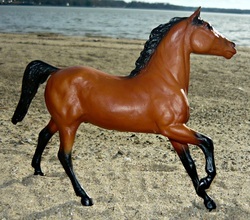 Amused Sea-1998 dark bay/brown. Sired by Seattle Slew (r), out of French Muff (r). 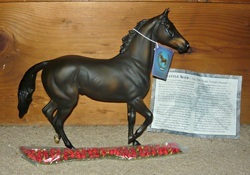 OF Breyer, Lonesome Glory,#474 Seattle Slew. Unknown Soldier-2000 chestnut. Sired by Sunday Silence-r, out of Big Book-r.
OF Grand Champion, Feed N Nuzzle stallion, All The Moves. DY Autocorrect-2002 chestnut. Sired by Fusaichi Pegasus-r, out of Catchin Fire-m.
Silver American-2002 Gray. Sired by Silver Charm-r, out of Synaesthesia-r.
OF Grand Champion, TB stallion, Tokyo Pride. Ghost Reaper-2003 Flea-bitten Gray (black or bay base). Sired by Spectacular Bid-r, out of Seattle Secret-m. Bred by Shadow Wolf Stables. 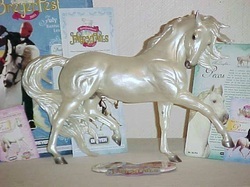 OF Breyer, Trad, MOW, #1271 Spectacular Bid. With a friendly little toad on his back. No harm came to the toad. 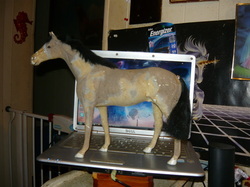 2010-Jumping The Gun, Gray (buckskin base) colt (x Installing Updates) Bred by Shadow Wolf Stables but owned by me. Shot of Platinum-2004 bay. Sired by Shot Of Thunder-r (AUS), out of Double Platinum-r (AUS). OF Grand Champion, Triple Action stallion. Bred in Australia and imported before being named. 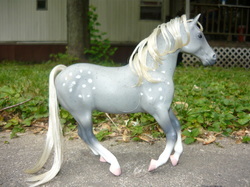 American Legacy-2007 gray (buckskin base). Sired by Silver American, out of Shergar's Legacy. Royal Risen-2010 Palomino Dominant White. Sired by Sato-r out of So Risen-m. Bred by Shadow Wolf Stables. 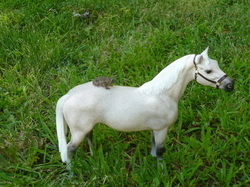 Jumping The Gun-2010 Gray (buckskin base). Sired by Ghost Reaper-m, out of Installing Updates-m. Bred by Shadow Wolf Stables. 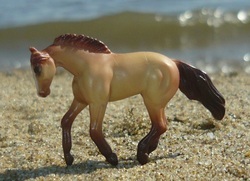 For Fox Sakes-2011 Liver chestnut. Sired by Smarty Jones-r, out of Cantare-r.
2016-Calm Yer Tots, palomino frame over and sabino colt (x Raid Wipe) o/b Spur Star Ranch. Fate-2011 bay. Sired by Royal Sham, out of Azure Jewel. Bred with the help of Shadow Wolf Stables. Elemental Fyre-2017 bay. Sired by Pants On Fire (r), out of My Elemental. OF Breyer SM, Running TB, #9178 American Pharoah. American Devil-2017 bay frame overo. Sired by American Pharoah (r), out of She Devil. Cant Stop Chrome-2018 palomino frame overo and sabino. Sired by California Chrome (r), out of Crime Stop. Pale Chrome-2018 palomino. Sired by Calfiornia Chrome (r), out of PaleEscape. Chrome Not Fazed-2018 liver chestnut. Sired by California Chrome (r), out of Faze Me None. Chromed Lava-2018 chestnut. Sired by California Chrome (r), out of LAva Lake. 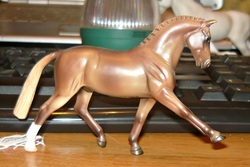 OF Breyer, Trad, Cigar, #1792 California Chrome.